When thinking about your irrigation system, you always want it to be as effective and efficient as possible. A properly tuned system will allow your landscape to grow and thrive during all the different seasonal weather changes that New England inevitably provides, while conserving water to keep water bills under control. There are several ways to help your system run at it’s best. The benefits of a WiFi Enabled controller are many, but the most clear is, well, control. WiFi controllers like the Hunter Hydrawise system utilize internet-sourced weather. This means your controller can automatically adjust itself based on the weather forecast. This ensures you aren’t that house that is watering it’s lawn in the middle of a rain storm that is forecasted to deliver 2” of rain. Going on vacation? WiFi enabled controllers allow you to sign into your systems where ever you are for that added peace of mind that your system is running properly. Seasonal changes also call for watering programming updates. 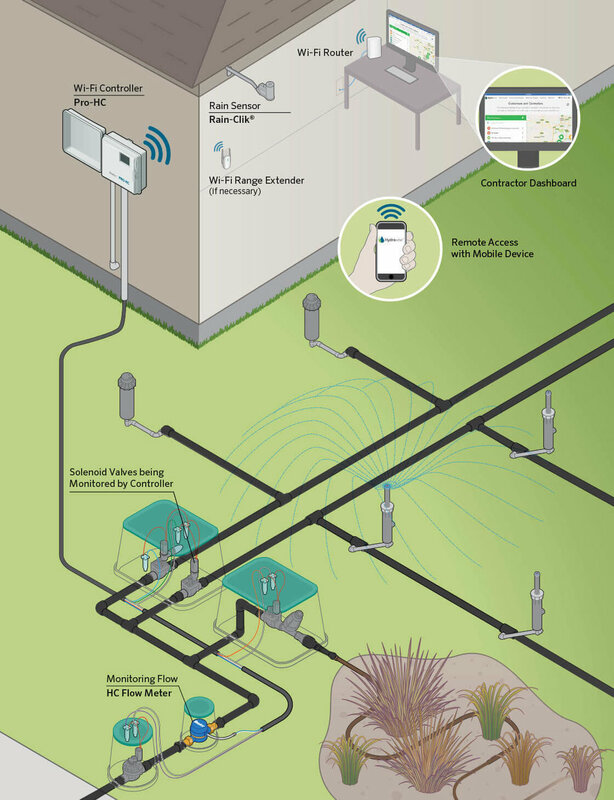 WiFi controllers allow your irrigation specialist to make these changes remotely to keep your lawn and garden watered at the most effective rate. Installing a flow meter and pairing it to your WiFi System will give you added protection from broken pipes or leaks that can lead to costly water bills. A Hunter Flow Meter can detect these issues along with solenoid and wiring issues allowing your irrigation system specialist to make timely repairs before it becomes a bigger problem. These are just a few components that you can use in your irrigation system to make watering your property more effective, improving on your water consumption and contribute to lower water bills. Reach out to us if you’d like to hear more or to request the installation of a WiFi Controller or Flow Meter. If you already have a Hydrawise system, we can add on a Hunter Flow Meter to your setup. Not only will this addition make your system more intelligent, it will also add peace of mind against costly leaks.